C-ABL antibody LS-C505755 is an AP-conjugated mouse monoclonal antibody to c-ABL (ABL1) from human and mouse. Validated for IF, IHC, IP and WB. ABL1 / c-ABL antibody was raised against recombinant Abl protein. Cellular Localization: Cytoplasmic and nuclear. Epitope: SH2 domain. 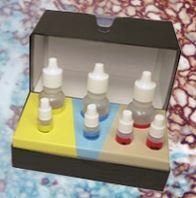 MW of Antigen: 120kD. Recognizes human c-Abl p120 and chimeric Bcr/Abl proteins. Species cross-reactivity: mouse.